Jaz at October Farm got me started on this journey of no-knead breads and the wonderful taste of artisan crunchy crusts with tender textures. I love to visit her because she has the most gorgeous gardens/yard in the whole world! I want to move in with her and just spend my old age rubbing her Chow Teddy's head while sipping a Mint Julep in any one of her many garden 'rooms.' You must check her out. But, mostly, check out her fantastic bread baking. recipe. 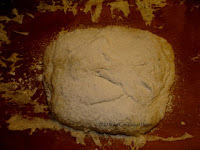 All the rising action comes from letting TIME take care of building the gluten in the breads. Just four ingredients (3 cups flour, 1/4 tsp. yeast, 1-3/4 tsp.salt, 1-1/2 cups water) will make a basic loaf. Add a Tablespoon of your favorite herb or spice and let your creativity flow. 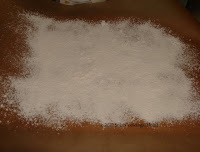 Place dry ingredients in a glass bowl, mix, add water and blend all dry ingredients with the water. 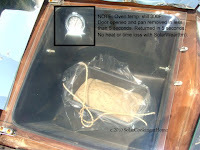 Cover with plastic wrap and let rest in a warm place for 18 hours. That's it. High heat along with retaining moisture in the first part of cooking makes for a crunchy crust, then you want to remove the cover for a luscious browning. 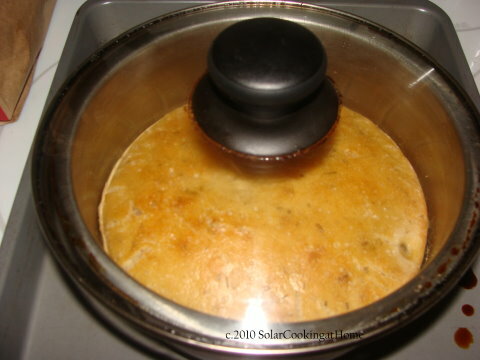 Heat a small pot in your oven to 450F, drop in the dough, cover and bake for 30 minutes. Remove cover, return to oven to brown for approximately 20-30 minutes more. I used the middle bowl of a stainless steel set with the cover from my 5-quart saucepan. Well, I'm all about reducing my BTU usage and cooking at 450F for an hour was more than I can psychologically handle. I had to see what kind of artisan bread I could end up with using the solar oven. I researched this no-knead bread phenomena and started anew. 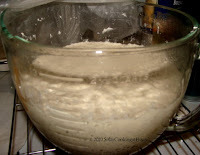 I started with the basic recipe, replaced the rosemary with my fennel-mint mixture, and put the dough in a glass measuring cup, covered it with cling wrap, and used my unheated conventional oven chamber for the rising. 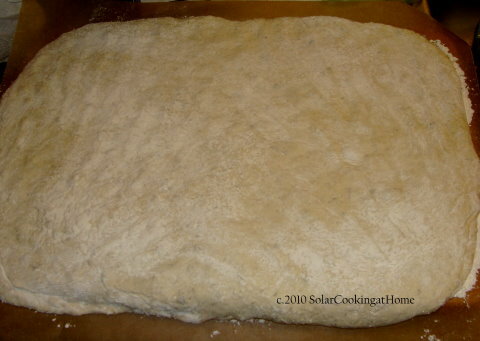 Following directions I found on another website, I removed it after 14 hours and the now bubbly and risen mixture was poured (this is a very soft dough) onto a well-floured piece of parchment paper that was cut just an inch or two larger than my pastry board. using my fingertips, I could gently spread the dough into a large rectangle the size of the pastry board paper. and, again, from the top and bottom, into thirds. Sprinkling the top with a little more flour, the ball of dough was placed seam side down back into the rising bowl, covered, and returned to the oven chamber for a final rising. Twenty minutes before the end of the final three hours of rising, I opened the solar oven for preheating. 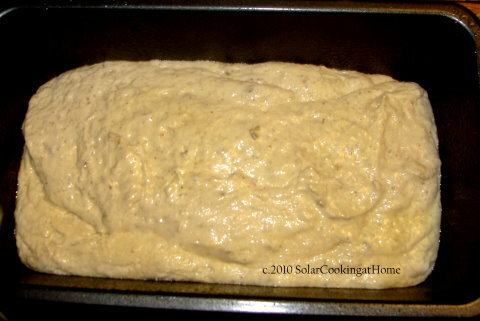 When the dough had finished rising, I poured it into an unheated metal loaf pan and gently eased it into shape. For that wonderful crunchy crust, I decided to put everything into an oven bag for the first part of the cooking. The solar oven had reached 300F and I could check the timing by using a timer and eyeballing when the dough had reached its cooked height. After 45 minutes, it was time to remove the oven bag cover. 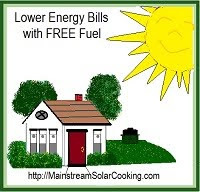 The SolarWear(TM) bottom made for easy placement and I want you to see the results. 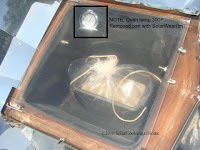 It takes just a few seconds to either remove or replace your pans and the cutting off the top of the oven bag probably took about 15 seconds. As you can see, there was no loss of heat in the oven and the bread was finished in another 30 minutes. 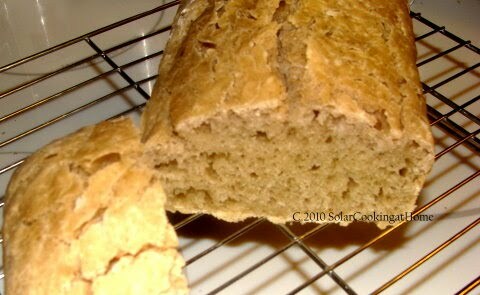 I was delighted with the end result of cooking this bread in a solar oven. The crust was crunchy and the inside texture dense but well-pocketed. It was delicious and gave me that same sense of eating an artisan bread. The only things I would do different would be to use less herbs for a lighter taste and to preheat the loaf pan to see what result that would bring. 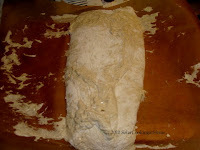 Using the oven bag was the right thing to do, to keep moisture around the bread in the first stages of cooking. 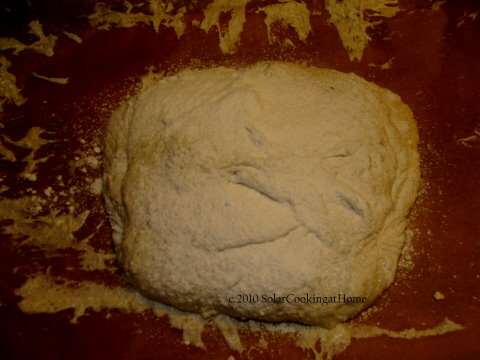 I hope you'll give this no-knead bread a try. It's easy, inexpensive, and makes solar sense. I´m with You on the fennel part, but mint? 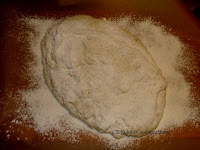 :-) :-) But it is a great bread and it´s so easy to do. By the way, I´ve looked all around on the net and elsewhere and no one sells solar owens over here. I guess it´s because we live rather north and have very short summers when we can use them. 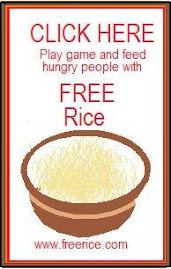 To bad, I really wanted to try it. 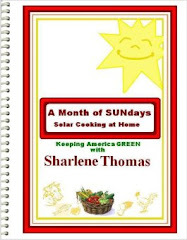 thanks for the shout out and i am so glad you enjoyed the recipe! I don't know if I could wait 18 hours for anything. 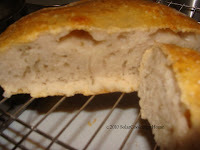 But I am a fan on no knead bread and don't know why I have never added herbs. Duh! 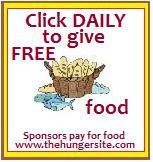 thank you for this recipe - i'd like to make bread and this recipe doesn't scare me and looks delicious! That looks really yummy.....I love bread of any description!!! Christer - It's just a touch of mint, doesn't overpower, at all...I agree on the nutmeg, though...don't know why but it just doesn't work for me, either...your short summers shouldn't affect solar cooking if you EVER have sun during the rest of the seasons...solar cooking can be done in the middle of winter, in 40F weather, if there's sun...it may take a little bit longer but check out my Jan.entry for a great winter meal...wait till my oven comes out and I'll ship you one, direct! 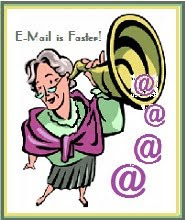 Christina - Thank you...it is! Emma - Then, you will love this...it's the closest you can get to that artisan taste without a brick oven...thanks for stopping by...you're welcome, anytime! I'm Being Featured on Writing Without Periods!